To suggest that we're swayed by superficial beauty would be wrong; our rigourous testing regime is about benchmarks, performance-versus-price judgements and, yes, spreadsheets of figures. And yet we confess that when we first saw Iomega's MacBook Air-inspired eGo Helium, we forgot all about that. Yes, it's just an external portable hard disk; yes, it's just USB; and yes, 90 quid is over the odds for a 320GB hard disk, but we're seduced nonetheless. The build quality doesn't match the Air, and indeed after only a few days of light usage there were some unsightly scratches appearing on the underside, but the styling cues it takes from the Air – those tapered edges, that metal-effect plastic – give a better interpretation of Apple style than Iomega's. Performance is reasonable. With a sequential read speed of about 26MB/sec, sequential write of almost 21MB/sec, and 10 and 13MB/sec for random sequential read and write respectively, this is squarely in the range we'd expect from a device of this type. It comes with a decent little software package, too; though the much-touted free 2GB of online storage from Mozy is nothing to shout about, but the bundled licence for Retrospect Express 6.1 from Iomega's parent company EMC is of some value. Frankly, we're not big fans of the Retrospect system, but it is at least a widespread solution, so you should be able to get support easily if things go wrong. The drive will, of course, work with Mac OS X 10.5's Time Machine backup system, and indeed, as a solution aimed at Mac users, it comes ready-formatted as HFS+. 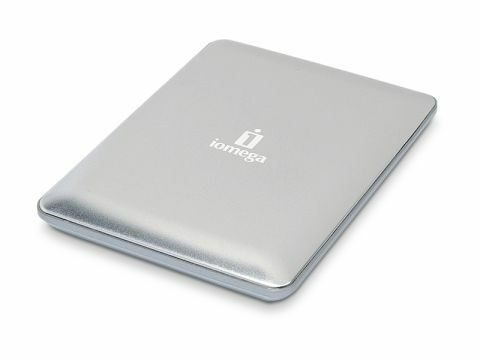 There are slightly cheaper portable drives of this capacity available, but the Iomega eGo Helium is a pretty little thing, and if you're buying it to sit next to your expensive MacBook Air, it's possible that you won't balk at the extra 15 or so quid.